VERY LARGE 2 FAMILY! Walk to downtown. 3 bedroom units with large kitchens and living rooms. Excellent for investment or owner-occupied. Binghamton High School Pre-School, High School / Public 3 0.86 mi. Macarthur School Pre-School, Elementary School / Public 2 1.22 mi. East Middle School Middle School / Public 2 1.25 mi. Benjamin Franklin Elementary School * Pre-School, Elementary School / Public 1 0.69 mi. St John The Evangelist School * Pre-School, Elementary School / Private N/A 0.66 mi. Children's Unit-Treatment & Eval * Elementary School, Middle School, High School / Private N/A 0.85 mi. 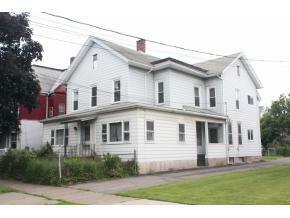 181 Hawley Street, Binghamton, NY 13905 multi-family home was sold for $77,380.